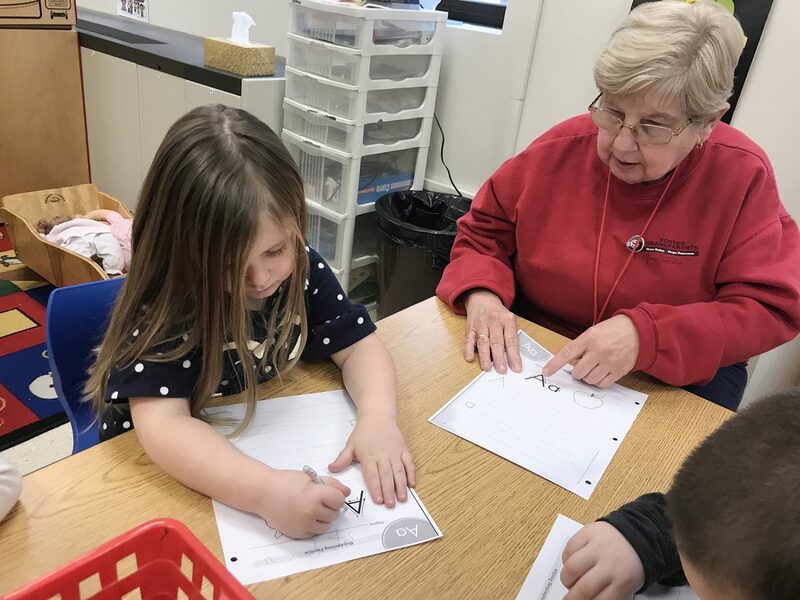 Jane Hughan, or Grandma Jane as the kids know her, worked with UPK students in Kim Knight’s class on writing their letters. She explains what they will be doing, but just as importantly, she encourages them to draw the letter “a.” Grandma Jane, along with Grandma Bonnie Johnson who works with third graders in Heidi Maggio’s classroom, volunteer their time helping children through the Lutheran Foster Grandparent Program (FGP). Grandma Jane has been a foster grandparent for seven years and Grandma Bonnie for nine years. The Foster Grandparent Program currently has 20 volunteers in the Jamestown schools. FGP is a federal program governed by the Corporation for National & Community Service. The program’s goal is to bring together two populations – older adults with children with exceptional needs. The focus is to establish a one-on-one relationship between a child and senior. Foster Grandparents are role models, mentors, and friends to children. Many times they are a constant adult in a child’s life and a good listener. Maggio loves having Grandma Bonnie in her class. In addition to nurturing a child, foster grandparents receive paid orientation, travel assistance, breakfast and lunch while working, accident and personal liability insurance and income-eligible individuals can earn a tax-free hourly stipend. The program provides a way for volunteers age 55 and over to stay active, serve their community, by engaging themselves with children and youth. If you are interested in becoming a foster grandparent, call FGP at 665-5354 to learn more.